In the southern-western corner of Sardinia lie the former coal fields of Carbonia. Closer to the coast the carbon land is covered by sand, and to free-standing, ungrafted, unirrigated Carignano vines that yield a naturally small crop of compact bunches, rich with sweet juice. It’s also home to the Esu family, custodians of Carignano, at their Carbonia estate. 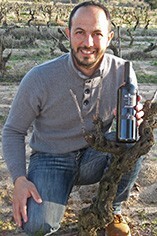 Enrico Esu’s father – whom he refers to as a cross between a farmer and a miner - planted their 10 hectares of Carignano (aka Mazuelo) back in 1958. It’s a grape first propagated by the (Spanish) Bourbons during their four-hundred year occupation of the island between the 14th and 18th century. Compared to the more commercially, volume driven neighbours reliant on vine clones, the Esu family treasure the original, ungrafted vines and look to perpetuate them on account of their excellent fruit.